I’ve been trying to get my email under control, and much of that has been focused on cleaning up all the various email lists I’ve been added or subscribed to over the years. 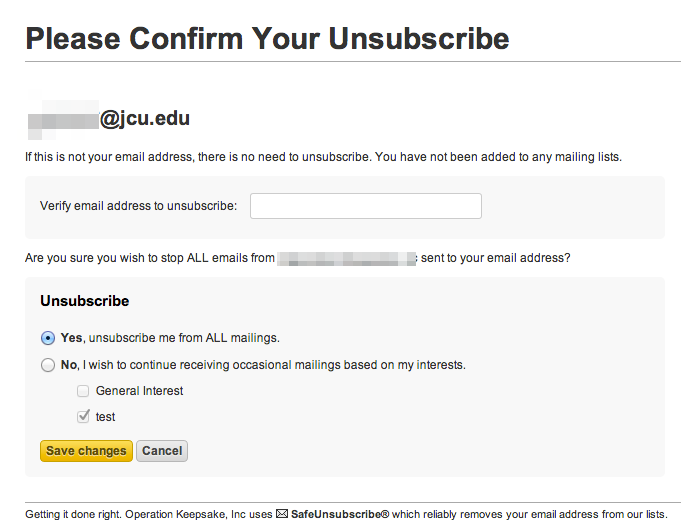 One thing I’ve noticed in my adventures in unsubscribing is just how much the process varies from vendor to vendor. 1. I am immediately unsubscribed and see a message on the screen telling me so. 2. I am shown what types of emails I am subscribed to from a current marketer. I can then select which lists I do not wish to receive any longer. The following things are unacceptible, and if I see them when I click on an unsubscribe page, I close the window and just mark it as spam in GMail. 1. If your unsubscribe page does not carry any information over from the link in my email and you force me to manually enter my email address. You get marked as spam. 2. If you give me a message after I click that says “You will be removed from our list in 8-10 days,” you get marked as spam. How can I be instantly added to your email list when I subscribe but it takes 8 days to remove me? Spam. So if you use Constant Contact’s “SafeUnsubscribe,” you are shown a redacted version of your email and a text box where you are expected, nay, commanded, to re-type what they already know. Strike one. 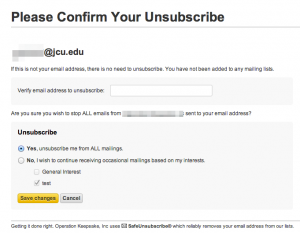 In addition to that, there’s a second set of buttons to say “Yes, I want to unsubscribe” or “No, stay on,” where I could adjust the emails based on “interests” that the email marketer thought to create. 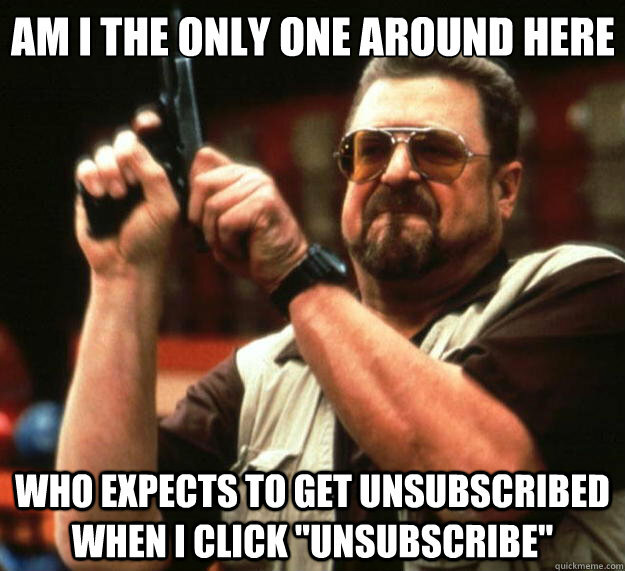 Finally, don’t email me right away to tell me that I’ve unsubscribed from your list. Tell me on screen. Don’t waste more of my time deleting yet another unwanted email. Next Next post: Why are we still limiting password characters?